As revealed in The Sunday Times at the weekend (subscription required), the Sutton to Sandycove walking and cyling route — which includes flood defences — is now estimated to cost over €100 million. Some of the details and related documents are below. The 22km route know as the S2S has stalled in many parts for different reasons. On the north side, phase 1, the Dollymount promenade and flood defences has been with An Bord Pleanala since 2009; and a section between the Docklands and Fairview Park had part 8 planning but objections from residents of East Wall convinced Dublin City councillors to drop the plans. The route was proposed by voluntary group s2s.ie (find them on Facebook here) and now supported by local and national policies. As reported in The Sunday Times, a report on phase 2 from Sandymount to Dun Laoghaire (Sean Moore Park to East Pier) puts the cost estimate of this section at €74.4 million. The Sutton to Sandycove Promenade and Cycleway Phase 2 Preliminary Design Report (file is a large 10MB PDF!) was completed in March 2010 by Scott Wilson for Dublin City Council and Dun Laoghaire Rathdown County Council. This report was obtained under environmental freedom of information. 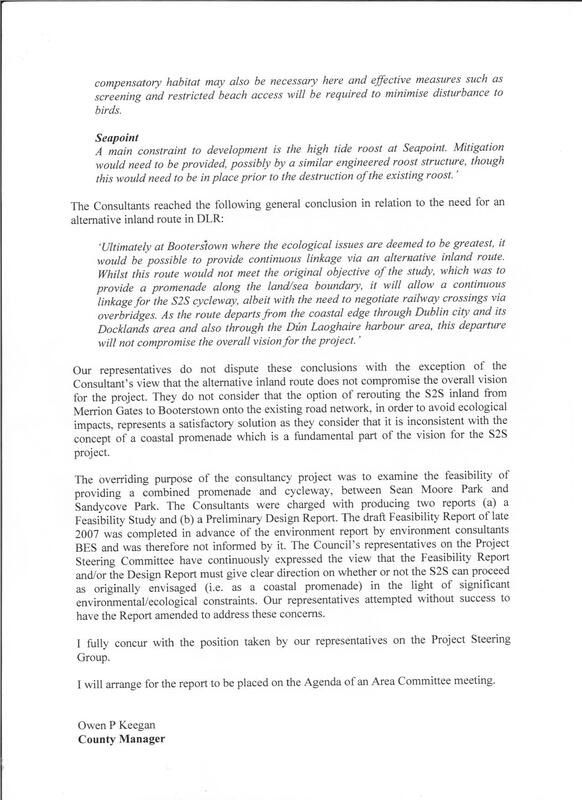 Dun Laoghaire Rathdown has labelled the report as “unofficial” and does not agree with its recommendation of an inland route between Merrion gates and Seapoint Station. 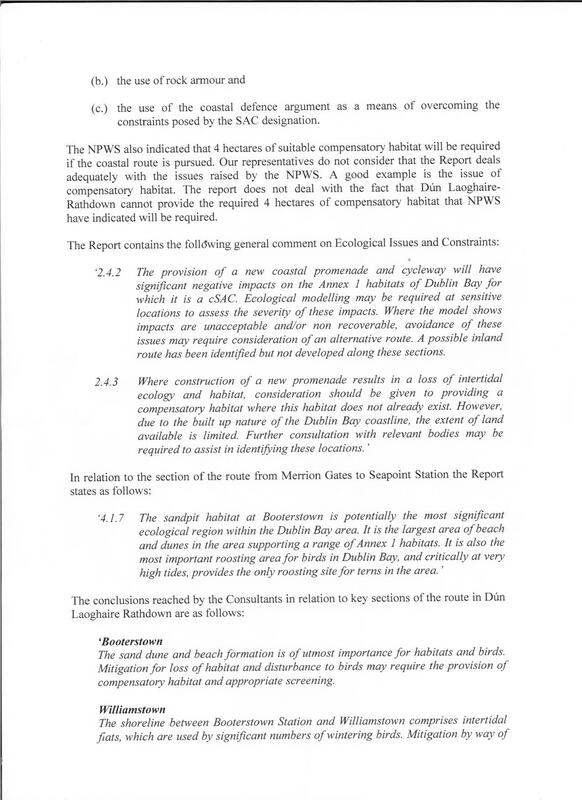 In reply to some of the points outlined in the manager’s report to councillors, he said he did not think the NPWS “stated our position in those terms” and he said “I don’t think we ever suggested that [the councils] were considering using the flooding argument as a pretext to getting something through, I don’t think that was the case.” He also said he was unsure about the 4 hectares figure. 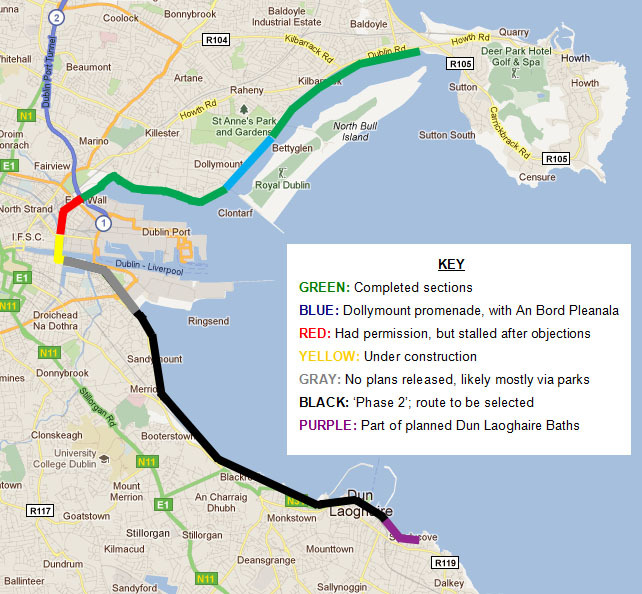 Dublin City Council said the exact route had not been confirmed and progress is dependent on funding.